Epic Water Filters challenge Brita slow filters, but it isn’t much of a challenge. The Brita Advanced Filter is a joke in my opinion. Every one I’ve tried and tested has clogged in a few days or even a few hours. You can find my earlier articles and videos about the sad state of Brita filters here on Helioza and on YouTube.com. I just made arrangements to acquire an Epic Pure Water Filter Pitcher for performance testing. When it arrives I will begin an extended test identical to the one I conducted on the Brita pitcher. My goal is to record the filtering time for a measured amount of water and plot those values versus time and gallons filtered. My Brita tests showed a marked and fast rise in filtering time. Epic Water Filters appear to be considerably different. First of all, the basic filter is an activated carbon block, not the loose granules used in other common water pitcher filters. That sounds like a better design to me because all the water is forced to go through the activated carbon. In granular filters some of the water will bypass the activated charcoal. This superior design in Epic Water Filters probably accounts for greater amounts of metals removed from the water. 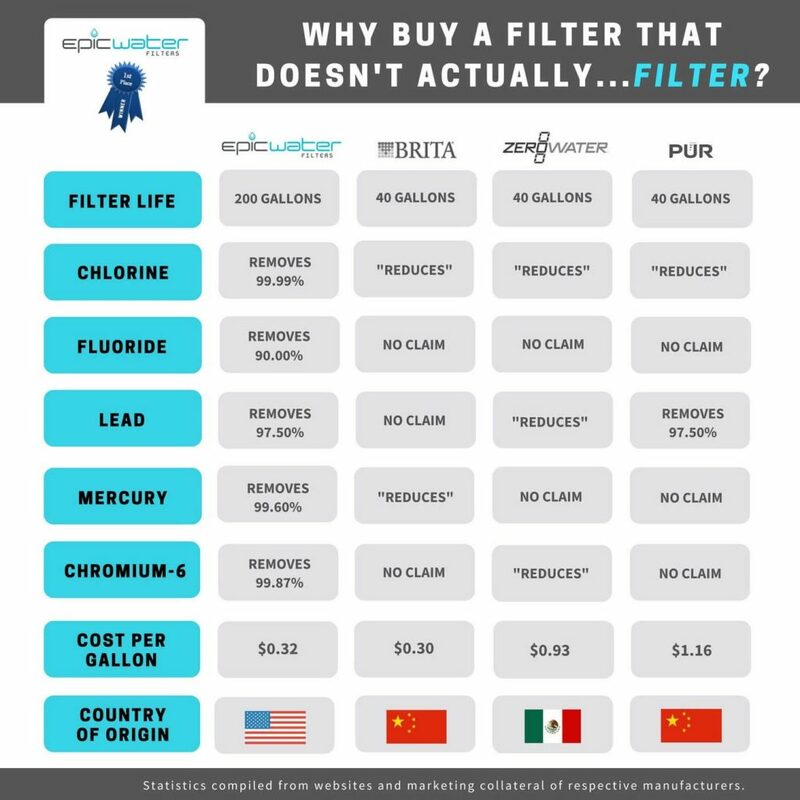 Most filter makers, like Brita, make no claims about exactly how much lead, mercury, hexavalent chromium, chlorine and fluoride their filters remove. Epic Water Filters does make claims and stands by the measurements. Check out this comparison chart. I’m excited about this opportunity to test a new and superior water filter. What’s even better, it’s Made in America. In fact, the company is just down the road from me, in Boulder, Colorado. 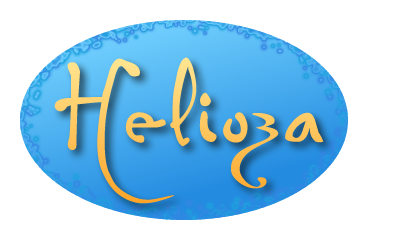 As I gather data, I’ll keep posting updates here on Helioza, and if you just can’t wait to try out Epic Water Filters, I have a great deal. Follow this link for a 15% discount on your purchase from Epic Water Filters. If you decide to buy an Epic product, I will earn a commission on your purchase. If you don’t, I earn nothing. I’m doing these tests because I am disgusted with Brita and think the Epic products will perform much better. Your discount should be automatically applied at checkout. If for some reason it doesn’t work, then just enter the discount code helioza on the checkout page. I’m interested, but wonder why I don’t see the results of your test. Since I need to find an alternative to Brita filters, the Everlast version of which completely clogged after only two weeks, I would like to see field test results that show the filters actually last for 200 galons.I realize tap water quality might affect that somewhat, but I’m amazed that Brita can get away with selling filters that don’t work for a fraction of the time they are purported to. Perhaps they figure our new Supreme court, as well as numerous lower courts, will be siding with businesses over consumers in the vast majority of cases. So, where are your results? Hi Mike – I apologize. I got really busy about 2 months into the test and haven’t had time to post the results. Short story: the Epic filter worked well for those 2 months. Filter time for 1 quart ran from 3 minutes to 6 minutes. Today I’m working on the graph for a new post. I’ll let you know when it is finished. If you decide to buy from Epic before I finish the post, use discount code HELIOZA for a 15% discount on any purchase. As for Brita, I’m convinced the problem is with the screens they added top and bottom to keep black carbon particles out of the water. Something clogs those screens, and I think it’s bacterial.